Holiday traditions can change with time. This year our family decided to add a new tradition to our holiday repertoire: an ethnic holiday meal from a different country each year. This year our family voted to study the holiday traditions and foods of France. 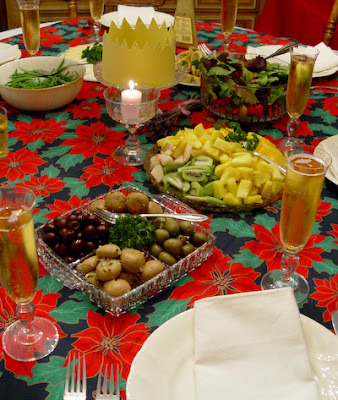 We celebrated with this festive feast on New Year's Day. French cookbooks, chats with friends who are French or have been to France, and Internet researched gave us a good start in preparing this special dinner. Instead of Santa Clause, Pere Noel brings gifts to children on Christmas morning and leaves them in their shoes that have been lined up by their fireplaces. Sweets, fruits, nuts, and candy are special Christmas treats. Most of the festivities such as puppet shows and plays are conducted in cathedral squares to commemorate the Nativity. French homes are decorated with a crèche. Tiny clay figures that are made from molds passed down through families since the 17th century are common. In addition to baby Jesus and traditional Nativity figures, the figures of local dignitaries are also added to these scenes. It is considered an honor to be included in the Nativity display. 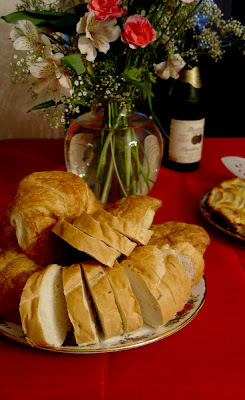 A choice of gluten-free and traditional breads were served. Making crepes without flour can be challenging, but I altered a recipe this way and that and ended up using cornstarch as a replacement for wheat flour. Surprisingly they turned out quite well and no difference was noted by feasters! 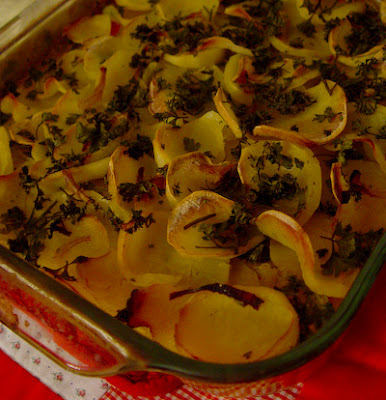 A French cassoulet usually is abundantly filled with duck, pork, and sausage. Our alternative was fermented soy tempeh that was diced and marinated with seasonings and soy sauce. It was fried to a crunchy appearance and then added to the small white beans, vegetables, and herbs for slow cooking on stove top and then transferred to a casserole baking dish where it was baked for an additional two hours. French families bake a Three King's Cake that has a small object hidden in it for one guest to find. The object can be a small toy or figure of baby Jesus. . .or a bean or almond. 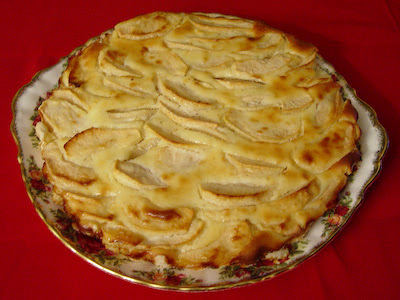 A variety of recipes for King's Cake were found, so we used a little creative liberty regarding our choice of cake and selected a French Apple Tart because it was easier to convert to gluten-free than most of the other recipes found. Instead of flour for the tart crust, a blend of macaroon coconut and cornstarch was used and a tender crust was the result. The lucky person to find the hidden object in the cake is crowned King or Queen for the day. In France, children look for the Kings and offer them the gifts of hay for the camels. 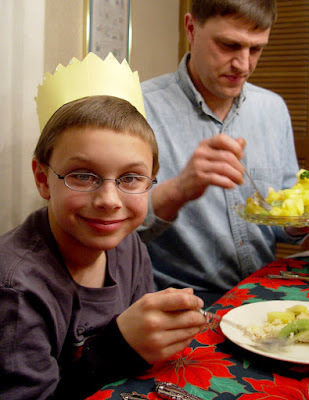 Cousin Levi was delighted that his slice of King's Cake contained the desired almond and he was adorned with a bright yellow crown that Rylan crafted. The little gems at each point sparkled as Levi danced around and enjoyed his role as King. Although our Christmas feast took place on New Year's Day, we didn't feel too out of sorts, as our research revealed that in northern France, adults share their gifts with one another on New Year's Day. Not wanting to break with tradition, we shared our gifts and enjoyed the day! Happy New Year! I think your idea for learning about a different country and their traditions is a wonderful idea. I enjoyed catching up with you and seeing all the wonderful pictures from your trip. Your grandmother must have felt very blessed for everyone to travel and celebrate her 104th with her! Your aunt's all day tea--how lovely and special! This sounds incredible! What a great idea!